Bhutanese Food: 25 Best Dishes To Eat When You're In Bhutan! Bhutanese food is un-like any other food you’ll ever eat. 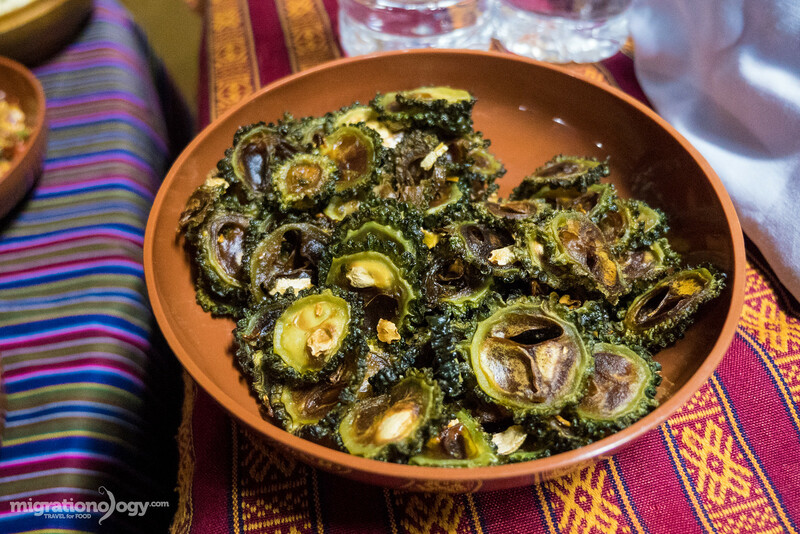 In this blog post I’m going to share with you 25 of the best Bhutanese foods. 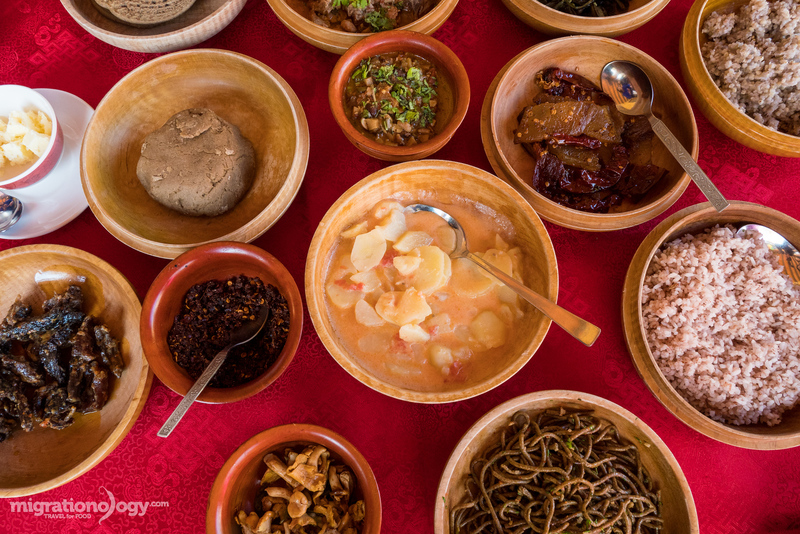 So prepare yourself to dive deep into the amazing (and little known) cuisine of Bhutan! First, what is Bhutanese food? Before going to Bhutan, I had no clue what Bhutanese food was. I automatically assumed it would be similar to Nepali cuisine, or similar to Naga food. But eating my first Bhutanese meal in Thimphu, I found out I was quite wrong. If you have some time, press play to watch my entire Bhutan video series, showing you the food and culture of Bhutan. I had a chance to spend about a month eating my way through Bhutan — from dried yak coated in fermented yak cheese to complex chili sauces made with over thirty ingredients and spices — all of which I’m excited to share with you. You’ll be impressed by how unique and delicious Bhutanese food is. 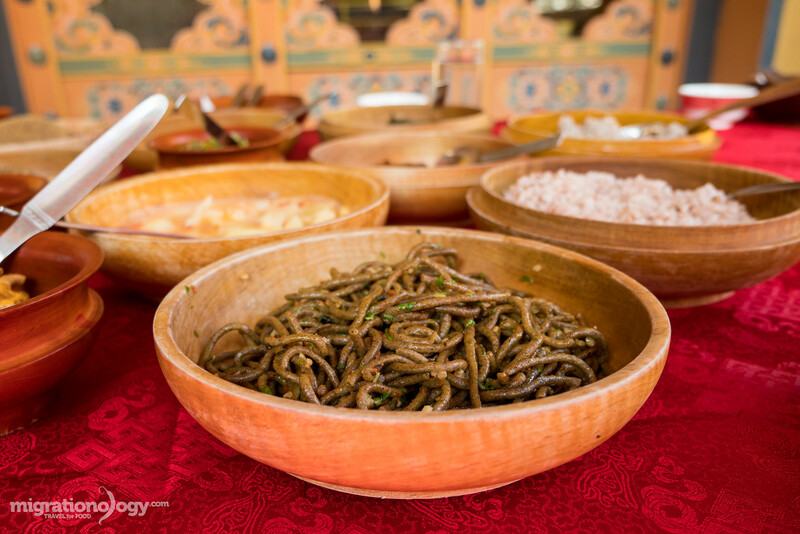 When you’re in Bhutan you’ll eat a range of Bhutanese, Tibetan, Nepali, and Indian food, which are all very common and well represented throughout Bhutan. However, for the purposes of this list, I’ve tried to stick pretty much to authentic Bhutanese food dishes, although there are definitely some crossovers, especially with Tibet. Anyway, I hope you enjoy this post, and if you ever have a chance to try Bhutanese food, please try it out — you’ll be in for a memorable food experience. We’ll start off with the most famous Bhutanese food of them all: ema datshi, which is chilies and cheese. 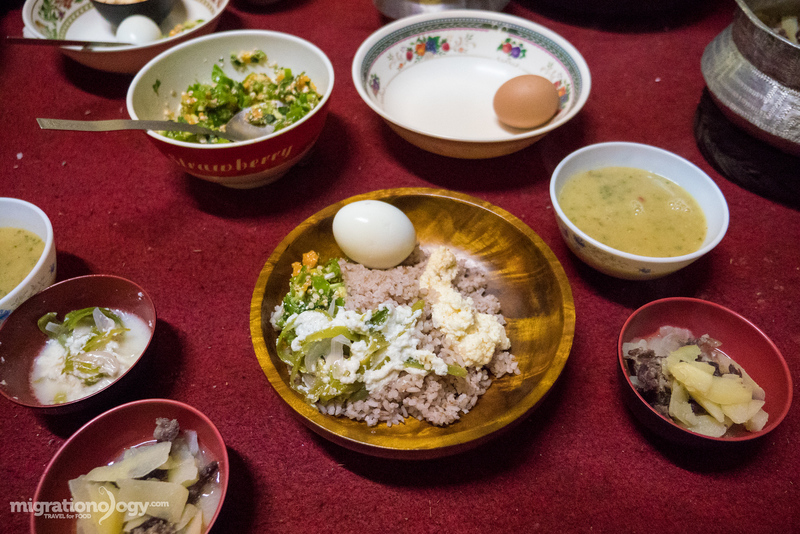 You’ll eat ema datshi not only everyday when you’re in Bhutan, but likely for just about every meal when you’re in Bhutan. 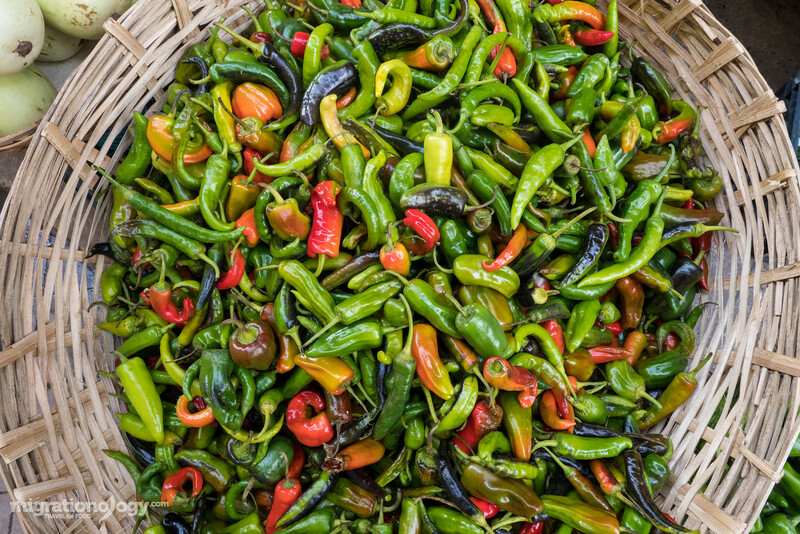 The chilies, which can be either fresh green chilies or dry red chilies, are sliced lengthwise, and cooked with datshi, which is local Bhutanese cheese, and plenty of butter for good measure. Although the basic ingredients remain the same, the more you eat ema datshi, the more you’ll realize that no two ema datshi’s are the same: every cook has their own version, some being lighter or more watery, others being richer and more sticky with cheese. Kewa is potato, so kewa datshi is potatoes and Bhutanese cheese. It surprised me by how similar kewa datshi is to a dish similar to scalloped potatoes. The potatoes are typically sliced into thin pieces, then sautéed down with cheese and lots of butter. 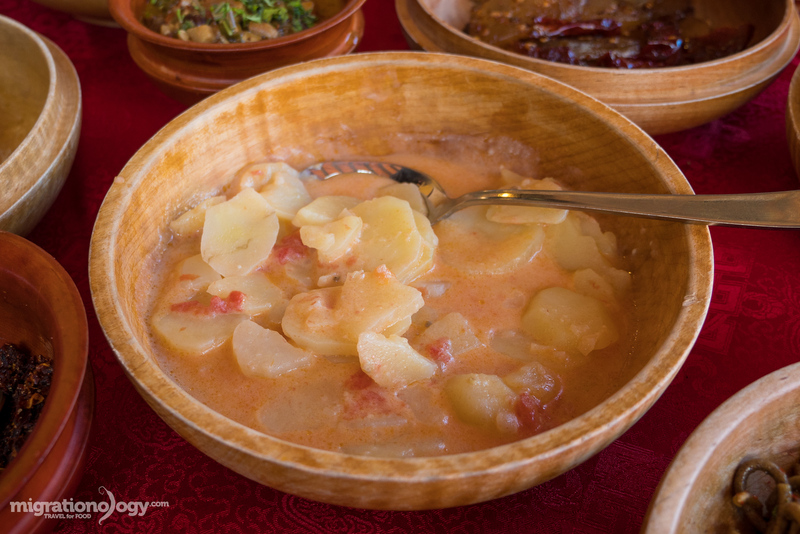 Sometimes cooks will toss in a few chilies or tomatoes, but usually, this is a Bhutanese dish that’s pretty mild, but just focuses on potatoes and cheese. 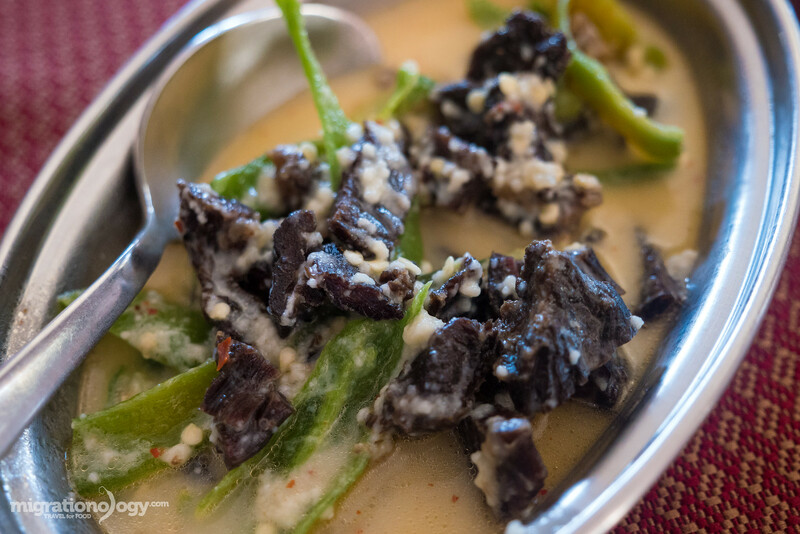 A third staple cheese dish in Bhutanese food is shamu datshi, cheese with mushrooms. Being a chili addict, ema datshi is my personal favorite variation of a Bhutanese veggie cheese dish, but shamu datshi was a close second. The mushrooms, which can be any variety of local Bhutanese Himalayan mushroom, are again, cooked into a cheesy saucy stew along with butter. Just like with all the other variations of Bhutanese datshi, you eat shamu datshi along with rice. If you haven’t already noticed, there’s just about no way you can go to Bhutan and eat Bhutanese food without eating lots of cheese. Datshi will probably one of the first words you learn in Dzongkha. Shakam is Bhutanese dried beef, which is among the most famous of meats. The beef is dried and preserved so it tastes similar to beef jerky, but thicker, and not quite completely dehydrated. 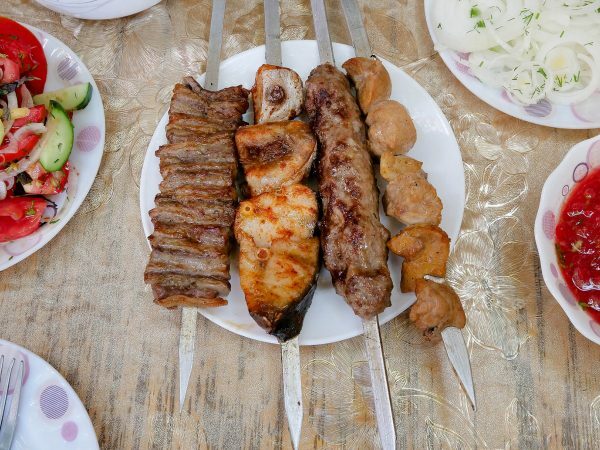 For shakam datshi, dried beef is cut into bite sized pieces and simmered with cheese and butter. What a combo this is. 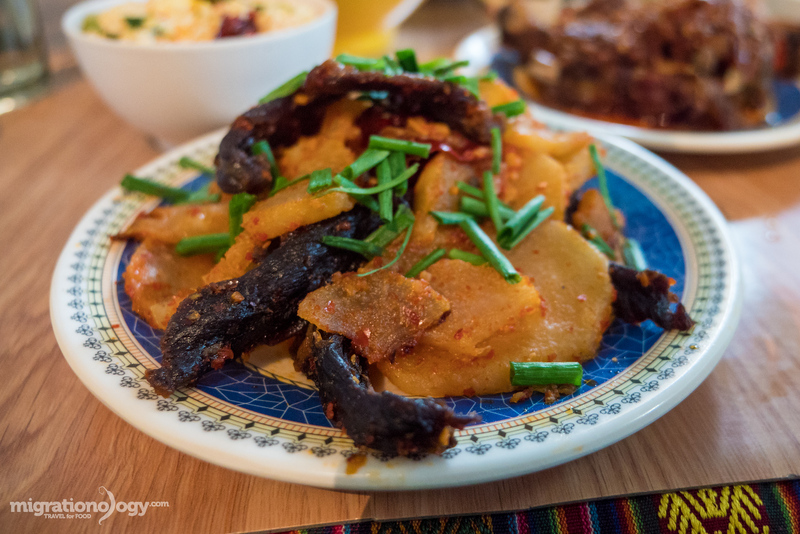 Shakam paa is a wonderful Bhutanese food of dried beef cooked with dried chilies and sometimes slices of radish. 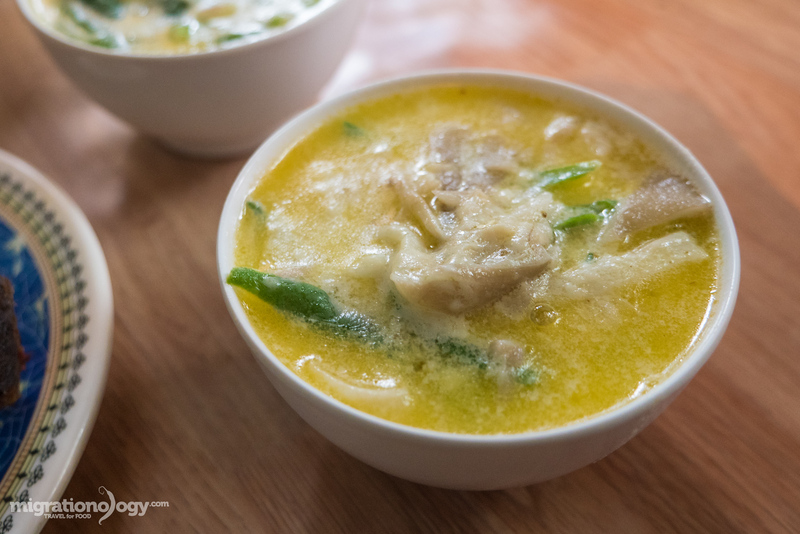 During my month staying in Bhutan, shakam paa quickly became one of my favorite protein dishes of choice. 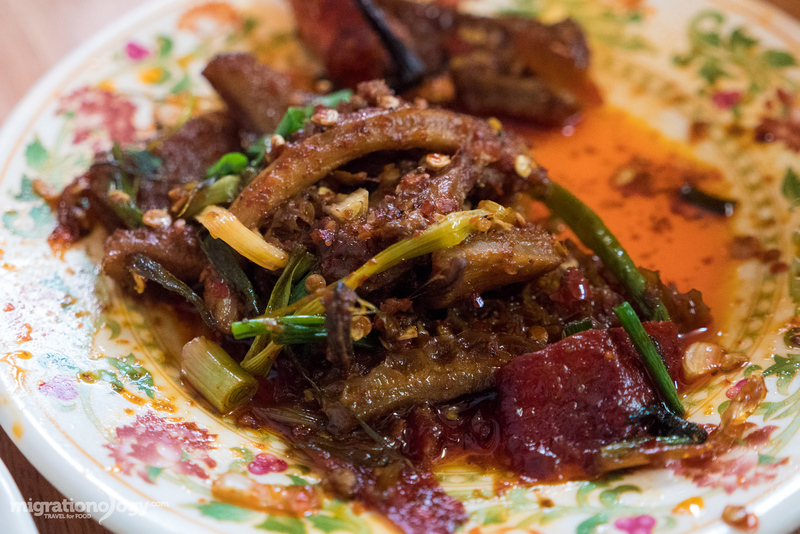 Again, the beef is slightly chewy from being dried and preserved, and it’s combined with lots of dry chilies. 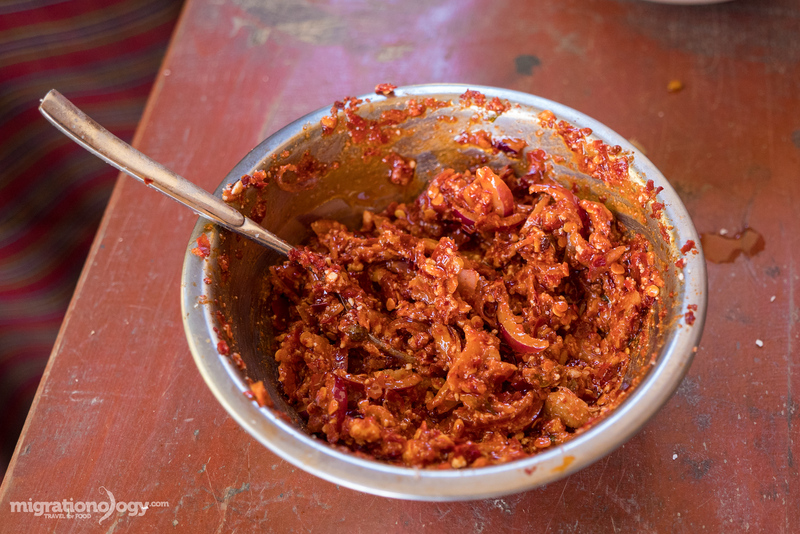 One thing I loved about Bhutanese cooking is how the chilies are just tossed in whole — don’t worry about slicing things up and making them look pretty — you get the whole chilies in Bhutan, amazing. Shakam shukam datshi is a rather rare dish that you won’t find at too many restaurants in Bhutan, but when I had it for the first time at a local restaurant in Thimphu, I immediately fell in love with the combination and especially with the unique white chilies. You probably recognize shakam and datshi already — chilies and cheese — but shukam are Bhutanese dried white chilies. So this Bhutanese dish includes cuts of dried beef cooked with cheese and white chilies. The white chilies ad an incredible sour spice which is quite unique. 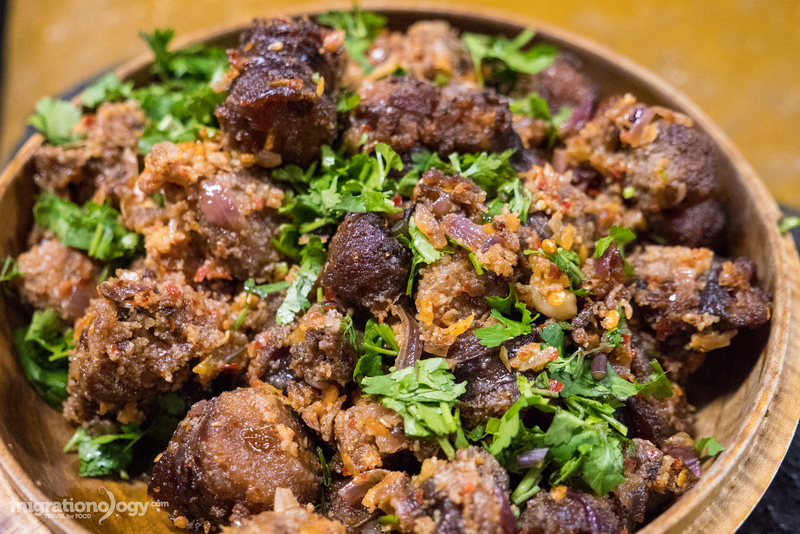 Along with beef and yak, pork is also widely loved throughout Bhutan, perhaps the most of all meats. For phaksha paa, slices of pork are stir fried with whole red dry chilies and sometimes some mountain vegetables as well. The result is another staple Bhutanese dish that goes great with rice and mixed in with some datshi dishes. Do you love bacon? Sikam paa is like bacon on the next level, and from my experience, this is a dish that many Bhutanese love with passion. You’ll see strands of half transparent pork belly hanging in the sun to dry — that’s sikam. The pork, which has quite an impressive ratio of fat, is dried in the sun. 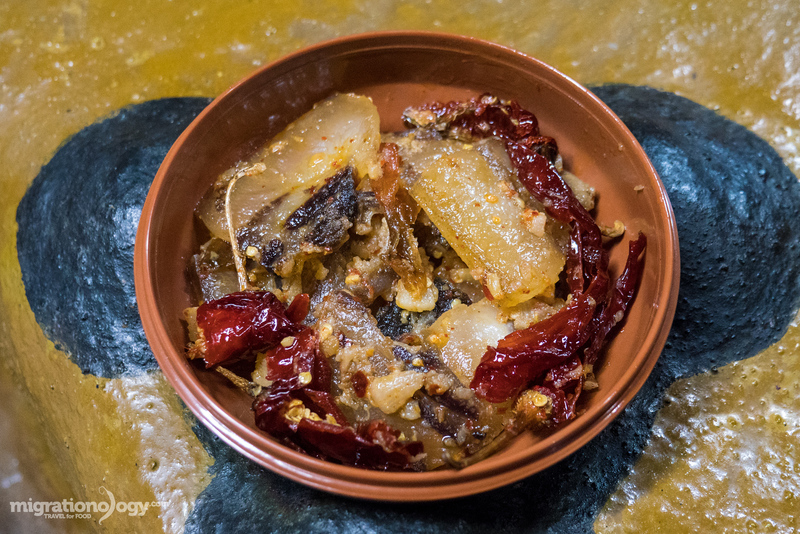 For sikam paa, the dried pork belly is then is fried up with dried chilies. I have to admit, sikam paa was pushing my oily food limits meter when I was in Bhutan. But a small piece at any meal, plus a bunch of the dry chilies, was what I most enjoyed about this famous Bhutanese dish. If there’s a meat that can be argued as better than dried beef, it’s dried yak meat. Yak is similar tasting to beef, but it has a little bit of a different fragrance (without being too gamey), and it supposedly is quite nutritional. 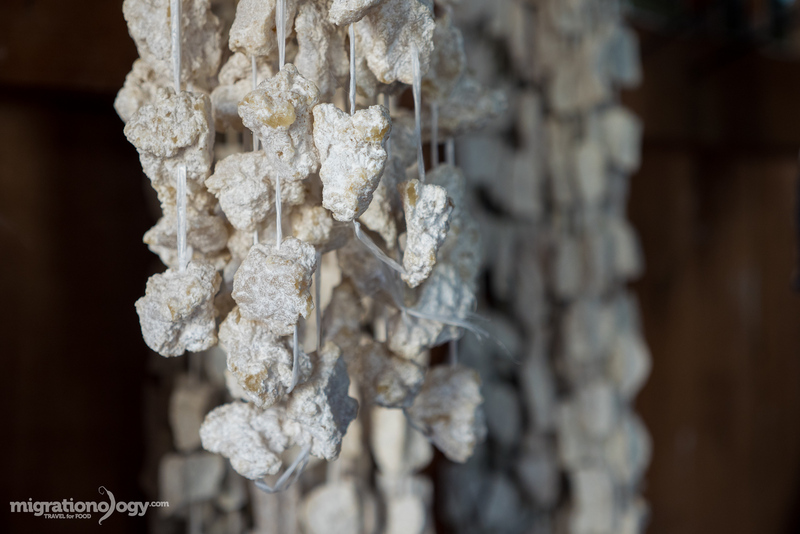 For yaksha shakam, the yak meat is dried into a jerky like meat and it can be cooked in a number of different ways. One of the best versions of dried yak meat that I ate in Bhutan was dried yak cut up and cooked with fermented yak cheese. It was a Bhutanese dish of dreams. 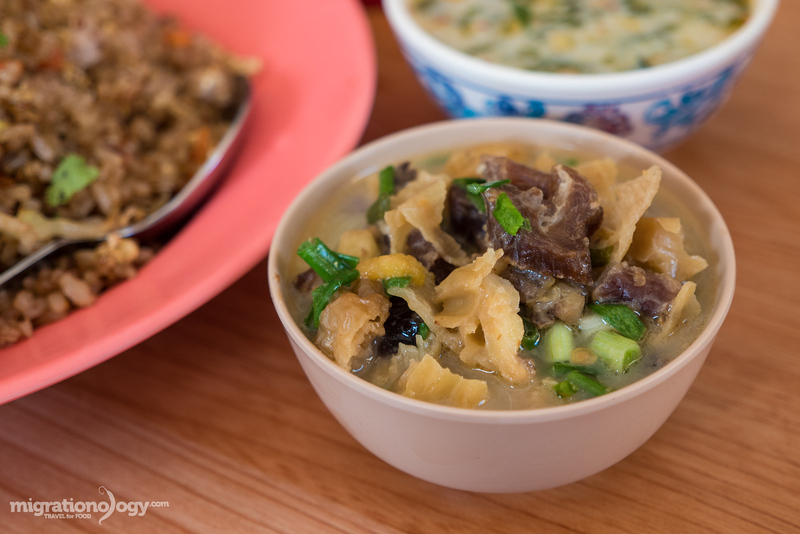 If you love tripe, goep in Bhutan, slices of tripe stir fried with dried chilies, green onions, and sometimes small vegetables, is an excellent dish. 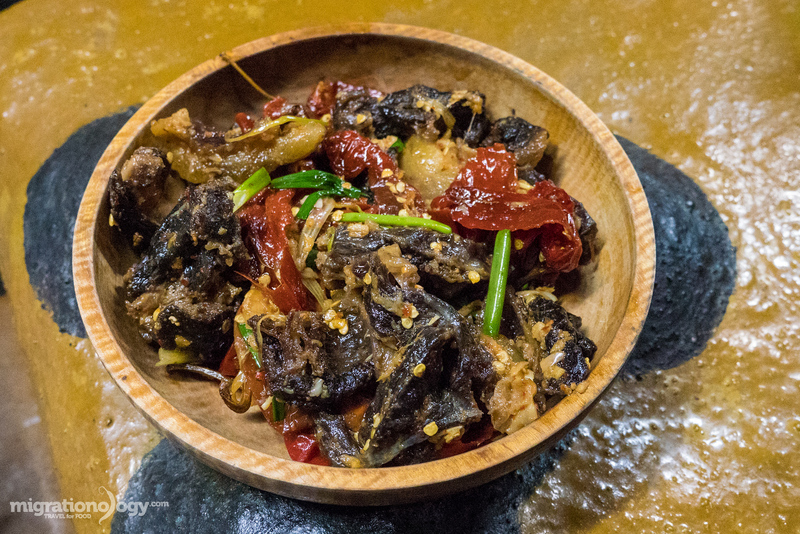 Just like so many other famous Bhutanese dishes, what I liked most about eating g0ep in Bhutan are all the dried chilies that are included in this dish. The tripe can be a little on the chewy side, but that’s the real texture of tripe. Juma is a type of common Bhutanese sausage made with minced meat, rice, and some light spices all filled into an intestines wrapper. The first thing I could taste on my first bite of juma was the wonderful citrusy zing of Sichuan pepper. Other than that, most versions of Bhutanese juma I tasted were a little plain tasting, but very meaty. 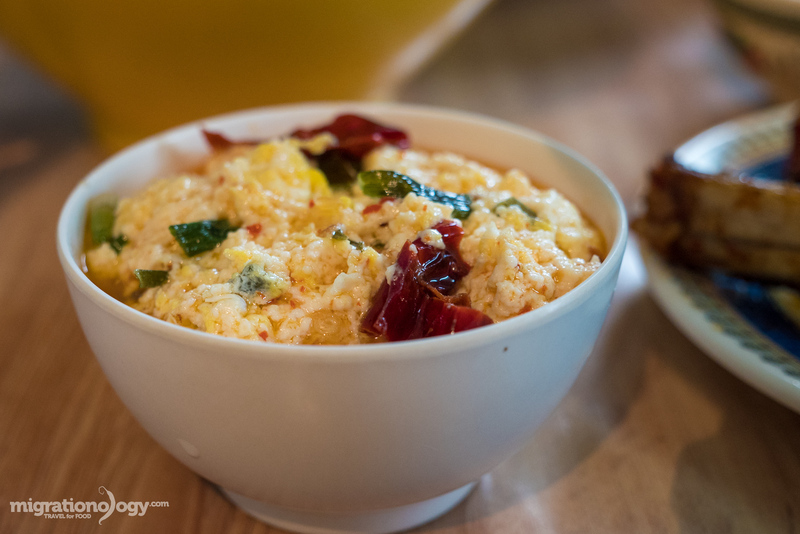 Butter egg fry, or gondo datshi, is like the ultimate Bhutanese scrambled eggs you can imagine. Eggs, are scrambled up with datshi cheese, and a huge amount of butter, and in some cases small bits of dried chili. The result is a very condensed scrambled egg cheese mixture that is fragrant from butter and packed with heartiness. If you have some Bhutanese butter egg fry, some chili sauce and a mound of Himalayan red rice, you’re in for a wonderful simple meal. Jasha maru is Bhutanese chicken stew, or sometimes called a chicken curry. One of the tastes I love so much about Bhutanese jasha maru is the noticeable ginger taste, that nearly every version of the dish had that I tried. The actual dry spice flavor is quite mild, but the ginger is what really gives this dish its essence. Momos are dumplings that are popularly eaten from India to Nepal to Bhutan and known as a Tibetan food – basically the entire Himalayan region – and even broader, they are very similar to any type of dumpling around the world, probably originating from China. Momos are easily the most common of all restaurant and street food snacks that you’ll find in Bhutan. They are served piping hot, filled with minced meat, cheese, or vegetables, and consumed with lots of Bhutanese chili sauce known as ezay. You can get momos freshly steamed or also deep fried momos, which are fried in oil after being steamed. Let’s just say, you’ll be in no short supply of momos when you visit Bhutan. 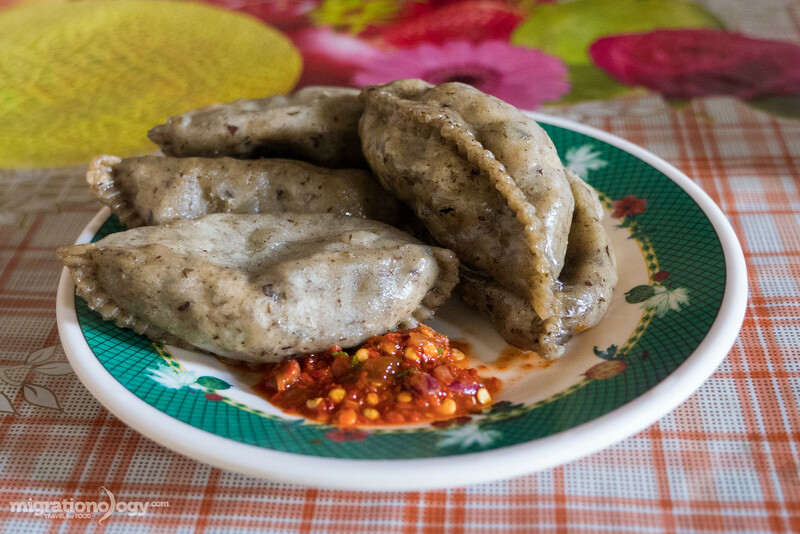 Known especially for originating from Haa Valley in Bhutan, hoentay are similar to momos, but they are made with a buckwheat dough wrapper. The dumplings are usually filled with a combination of a local spinach or turnip leaves and cheese, and again, they can either be steamed or fried. When I was in Haa Valley for a few days, I enjoyed numerous plates of hoentay, which are hearty and filling, and are especially good when drowned in Bhutanese chili sauce (ezay). Due to the harsh winter conditions in many areas of Bhutan, vegetables can sometimes be scarce in the winter. Lom, which are turnip leaves, are one of the few vegetables that can be dried and preserved and eaten throughout the year. The actual turnips themselves are fed to the livestock. For lom, it can be sautéed by itself, or cooked with some sikam (dried pork) to give it some extra delicious flavor. I really enjoyed eating lom when I spent some time in Phobjikha Valley. At the farm house I stayed at, they had turnip leaves hanging above the wood burning fire, drying out and ready to re-hydrate and eat at any point throughout winter. I’ve been fascinated and loved eating bitter melon / gourd for many years now, which is called khtem in Bhutan. Something about eating something so bitter, which sometimes kind of throws off your taste buds, is exciting to me. In Bhutan I noticed mostly Indian bitter melon as opposed to the longer Chinese biter melon. Bitter melon in Bhutanese cuisine is often sliced into thin chip like pieces and fried with butter and a little seasoning. I had it in Bhutan for breakfast a few times. Jaju is Bhutanese milk and vegetable soup. It’s often made with some type of local spinach or turnip leaves or any number of light leafy vegetables. The soup broth consists of milk and butter. 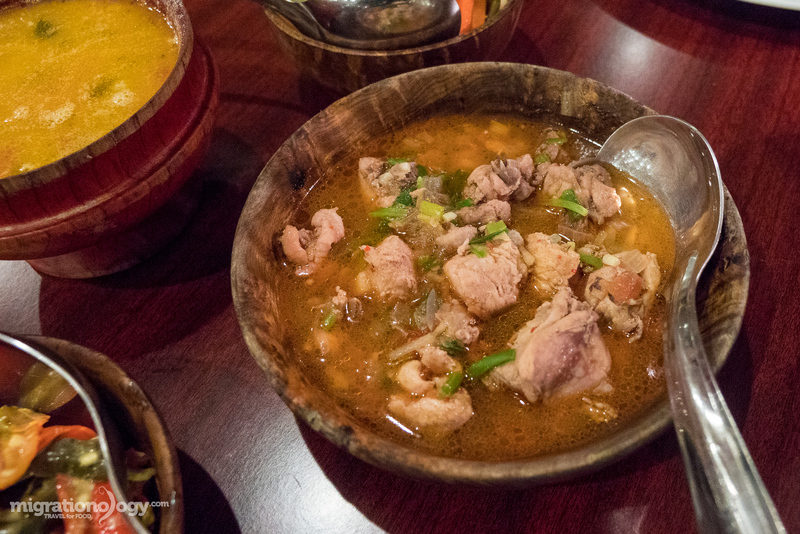 Overall, the taste is usually quite mellow and plain, but it goes well together to supplement a full Bhutanese feast. When I was in Bhutan I ate some versions of jaju that were very light while others included a bit of cheese to make them heartier and more rich. Although many Bhutanese dishes can be pretty meat heavy, goen hogay is a traditional Bhutanese cucumber salad. 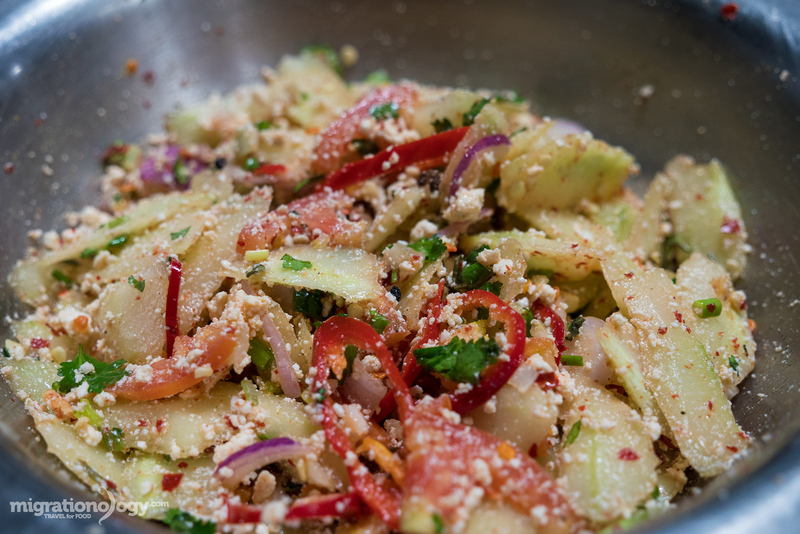 Cucumber is sliced up and mixed with chili flakes, tomato, cilantro, onions, Sichuan pepper, and a crumble of datshi cheese for extra flavor. Sometimes some extra oil is also added to the recipe to give it a dressing like sauce. I found goen hogay to be a very refreshing Bhutanese vegetarian dish and ordered it at every chance I could. I especially enjoyed the Sichuan pepper zing it often comes with. 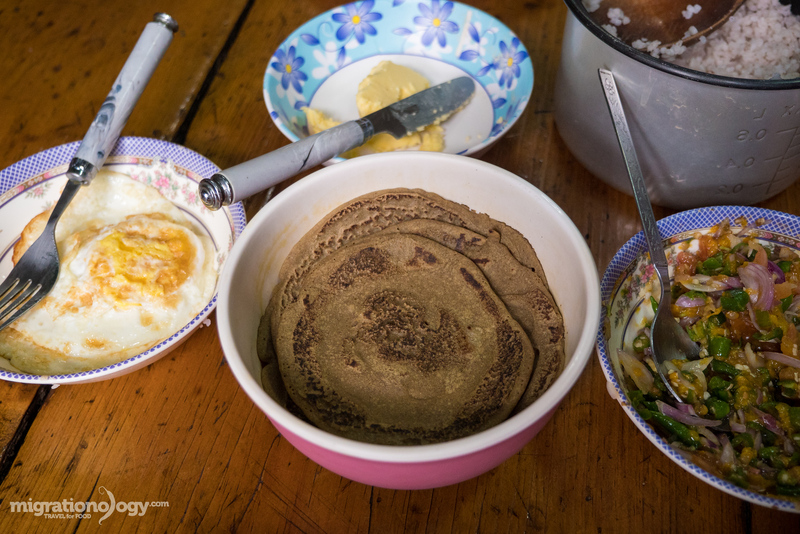 Especially common as a Bhutanese breakfast food and for on the go eating in Bhutan, khur-le is a Bhutanese pancake made from buckwheat, wheat, or barley flour. You typically eat khur-le along with Bhutanese main dishes, like ema datshi or shakam datshi, or even just with eggs and ezay (chili sauce). 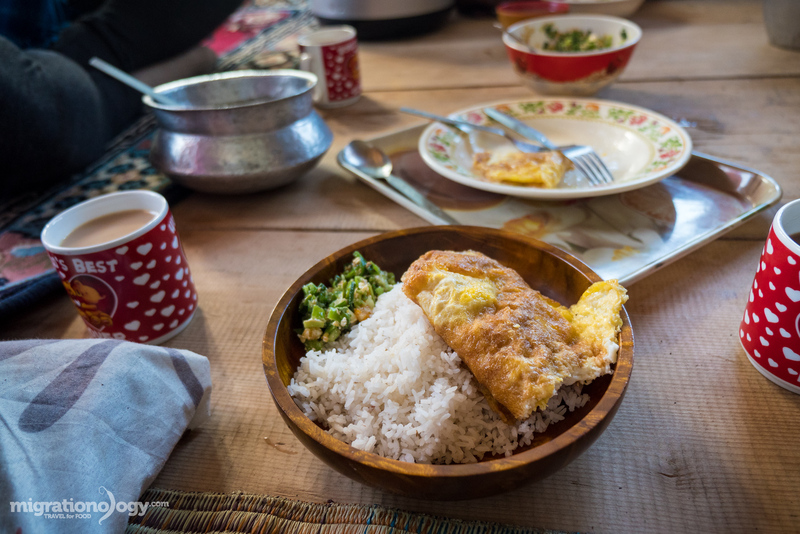 When I was in Haa Valley, Bhutan, I ate khur-le just about every day at my home-stay for breakfast. They have a spongy texture, but are a bit more hearty and filling than a white wheat flour pancake. They are the type of pancake you want to be eating in a cold climate. Especially common in the Bumthang region of Bhutan, puta are noodles made from highly nutritious buckwheat that can be grown in high altitudes. For puta, the noodles are prepared and boiled, and sometimes before being served the noodles are stir fried in mustard oil along with a light seasoning of salt and Sichuan pepper. Puta are a traditional Bhutanese staple, and they really reminded me of Japanese soba noodles. 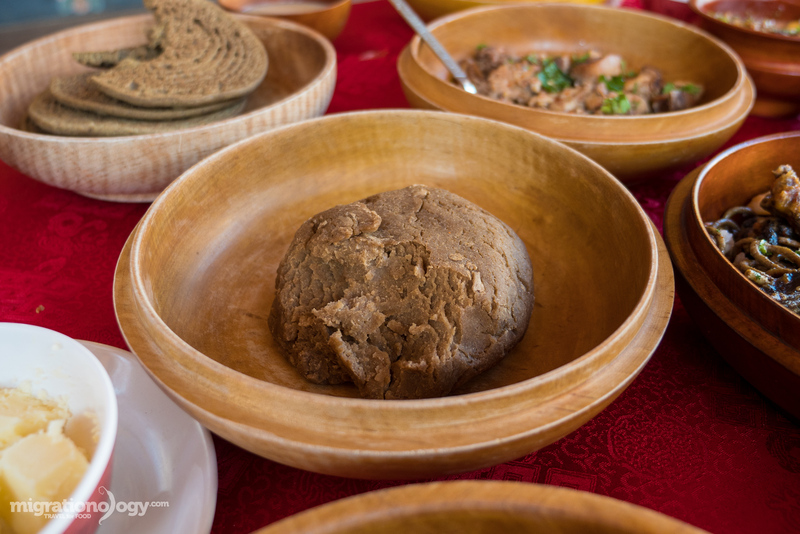 Made from whole wheat flour, tshampa is a dough starch that’s eaten as a staple filler, that reminded me of eating ugali in East Africa. It’s very starchy and very heavy, and has a dense dough consistency. In order to eat tshampa, you can roll it into a ball in your fingers, and eat it together with any number of main Bhutanese dishes like ema datshi or shakam paa. 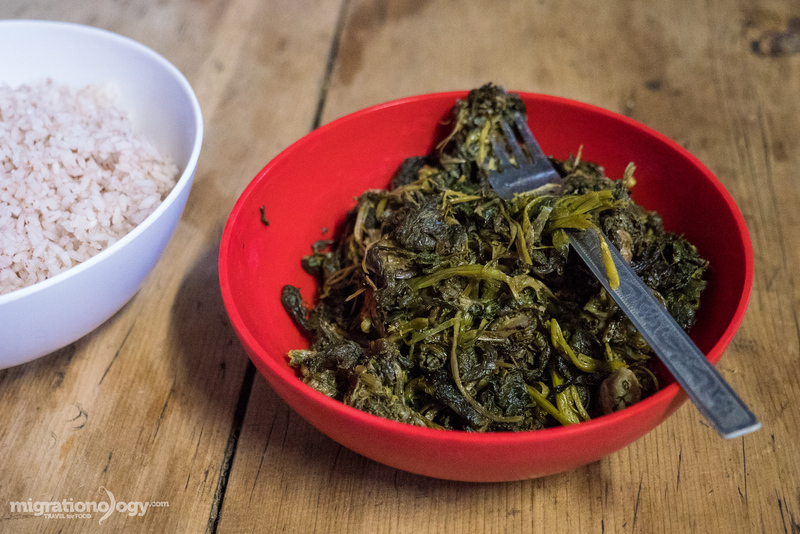 I only ate tshampa once in Bhutan, at the Folk Heritage Museum Restaurant in Thimphu, and the owner explained to me that this is one of the Bhutanese foods that’s traditional, but not very popular anymore, yet it’s healthy and hearty. 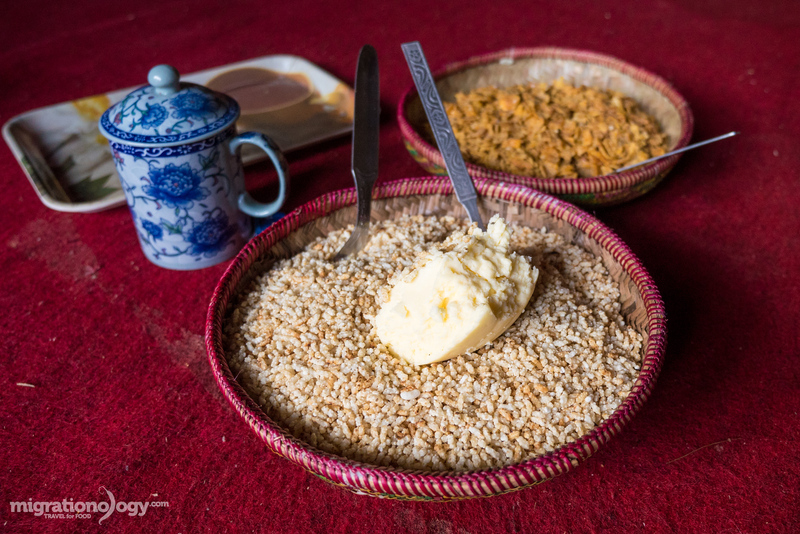 At just about every local home I visited in Bhutan, they would offer milk tea (chai) or suja (butter tea) plus a communal basket of puffed rice known as zaow. Zaow is not too puffy but more on the crunchy side rather than the puffy side — it has a texture almost like the crunchiness of un-popped popcorn. It’s a Bhutanese snack food that’s very common and it goes so well together with a cup of tea. Sometimes zaow is eaten with chunks of butter mixed in. 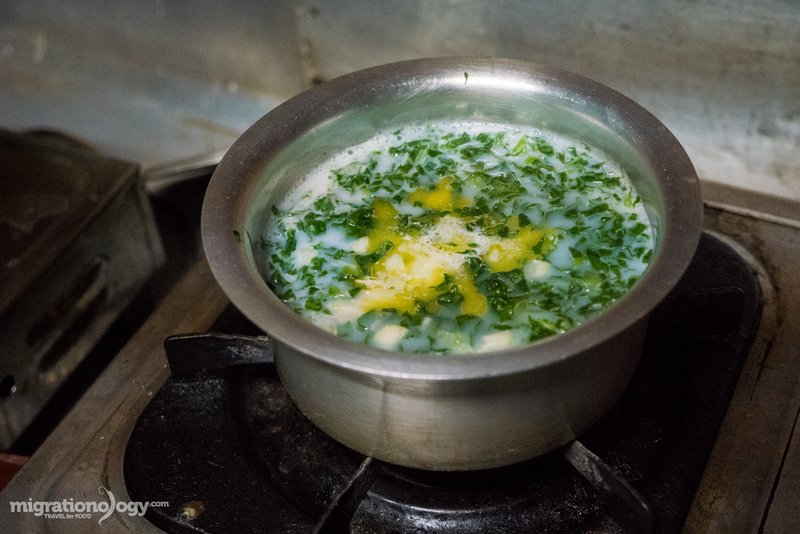 The most memorable version of zaow I was served in Bhutan was in Phobjikha Valley, and it came with a frighteningly large chunk of butter on top! Chogo (chhurpi) – hardest cheese in the world? Chogoo (or chhurpi) just might be the most rock hard, yet edible, cheese snack in the world. This dried yak cheese, which is also common throughout Tibet and Nepal in the Himalayas, is the ultimate preservation of cheese, and it’s so hard you have to gnaw on it for hours before it starts to dissolve on your tongue. It’s the type of snack you eat when you’re walking through the rugged mountains and you need to be chewing on something. You’ll see strands of chogoo hanging like necklaces around markets in Bhutan. Give it a try! There’s no way I would compile a list of Bhutanese food without paying full respect to ezay, which refers to any kind of Bhutanese chili sauce. 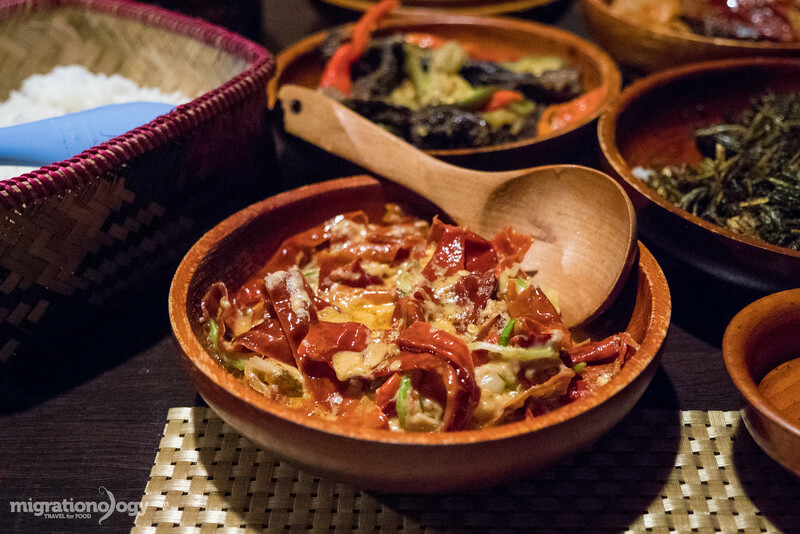 Now you might be thinking, chili sauce is not really a food… but in Bhutan, ezay is so mandatory to eat with every meal that it can be considered a dish of its own. And sometimes it’s almost more like a salad than a chili sauce. From my first meal to my last meal in Bhutan, I couldn’t get enough ezay. And I don’t care what I’m eating, ezay literally goes with and complements every Bhutanese food you can imagine. Just like ema datshi, there are no two ezays that taste the same. Everyone in Bhutan has their own recipe and combination of ingredients. A couple of my favorites include dried chilies, Sichuan pepper, tree tomato (amazing ingredient), and a sprinkle of cheese for extra flavoring. Suja is the Bhutanese term for butter tea, and although I didn’t include it as a food on this list, due to its cultural importance, I couldn’t not mention it. I grew to really enjoy butter tea when I was in Bhutan, especially on cold mornings. Butter tea, which is the drink of choice throughout Tibet and parts of Nepal as well, is tea which can be made with regular tea leaves or mountain herbs, churned with butter and salt. The saltiness of butter tea might surprise you at first, but it’s something that can grow on you. I started calling suja, power tea, when I was in Bhutan, and I couldn’t start my mornings without it. 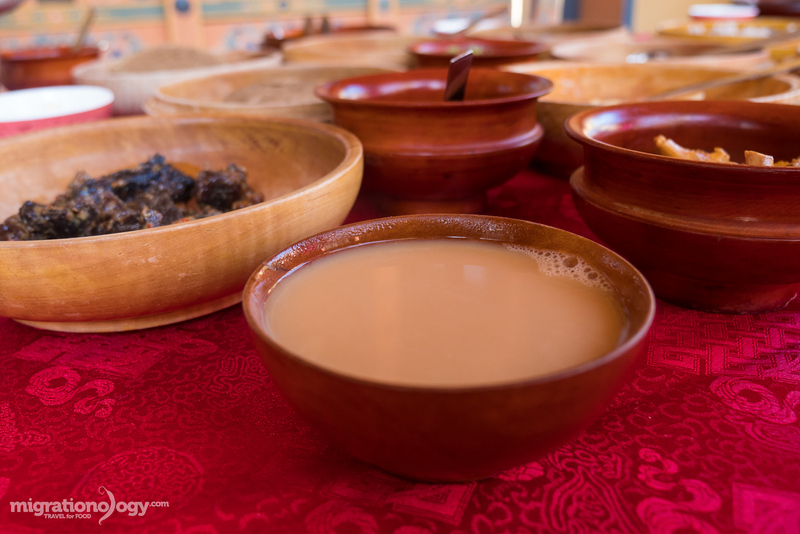 Sometimes Bhutanese butter tea will be saltier or less salty, and more or less oily depending on how much butter is used. You can also make suja with either cows butter or more traditionally, yak butter. How to get Bhutanese food? Along with having some amazing and unique dishes in Bhutan, another thing that never fails to fascinate me around the world is the culture that revolves around eating, and Bhutan food culture runs deep. In Bhutan, traditionally food is served in and eaten from beautiful wooden bowls, and you’ll still often be served food in wooden bowls at traditional restaurants and some local homes. However, due to ease of use and being easier to clean, eating from wooden bowls are becoming less common on a daily basis in Bhutan. The wooden bowls brings us to the next point, eating with your fingers. Like in much of Asia, the traditional method of eating is with you fingers. And, as the owner of the Folk Heritage Museum and Restaurant in Thimphu explained to me, if you use metal cutlery on traditional wooden Bhutanese bowls, it scratches and ruins them — so it’s better to use your fingers. 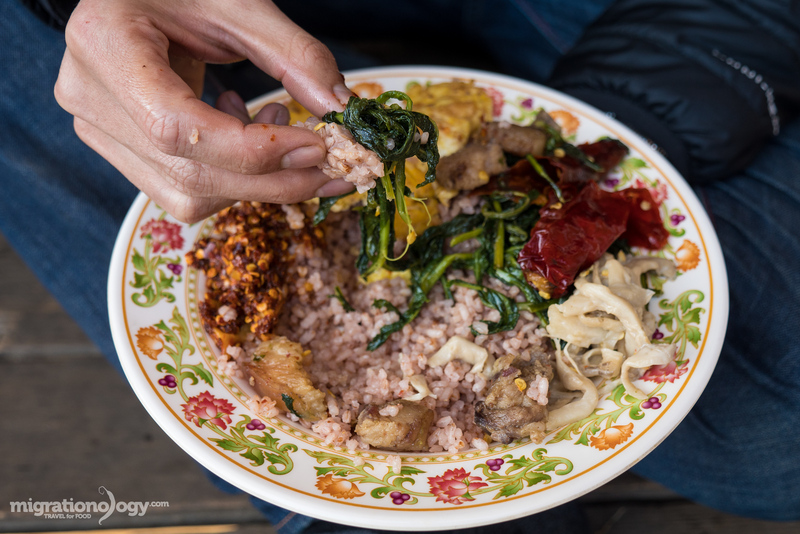 One of the traditional methods of eating Bhutanese food is to smash a little bit of red rice into a small ball, then scoop up a dish of your choice. Another method, I tried to learn and got a little messy, is to eat some of a dish with your fingers, then for the rice, put it in the palm of your hand and toss it into your mouth, similar to eating and tossing peanuts into your mouth. 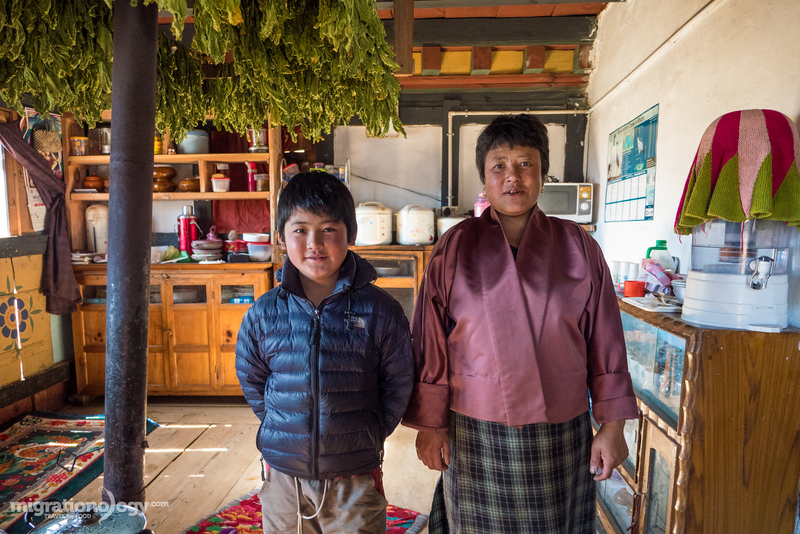 The best Bhutanese food you’ll have is home-cooked! The Kingdom of Bhutan is one of the most enchanting and most culturally preserved nations in the world. And although Bhutanese food is little known outside of Bhutan, it’s a cuisine that if you have the chance, and if you love to eat, you’re going to want to explore. 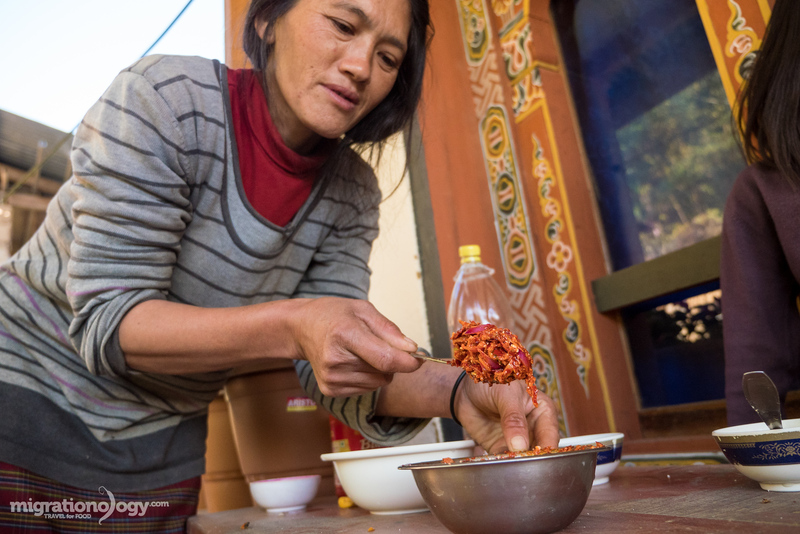 From ema datshi (chilies in cheese sauce) to dried yak, and incredibly delicious chili sauce combinations, Bhutanese food is both exciting and packed with flavor. Hope you enjoyed this list of Bhutanese food! Disclaimer: It was an honor to have a chance to visit Bhutan, and it wouldn’t have been possible without MyBhutan who sponsored my visa and invited me to explore Bhutanese cuisine. MyBhutan is a portal for planning and booking a trip to Bhutan. Also, thank you to Chechay from Bhutan Musk Travels for all of her help. 174 comments. I'd love to hear from you! I spent more than two years in Phuntsholing, Paro and Thimphu in 70s. Your description of all the dishes is very authentic. Most of the dishes are available in Druk Hotel in Phuntsholing and small mom and pop type stalls. Hello! I read this post about 10 times already lol. I’m a Brazilian living in Bhutan and I work with a travel operator here. So, I’m always reading tips about all types of Bhutanese food around here. I love it but I have serious problems with the hot cillies. I love the way you write! I have always wanted to go to Bhutan and this post of its food is making my mind certain of going there. Its really great how you have explained about every dish in your post along with mouth watering pictures. Good work! I have just come back from 10 days in Bhutan and am suffering from cultural re-entry shock. Your list of foods is a great help! Thanks Olivia, glad you had such a great trip to Bhutan! These dishes all look so tasty. Bhutan is on my travel wish list so hopefully will make it there soon and try to eat as much of these dishes as possible. Thanks for your detailed views on so many recipes. It was very helpful for us when we were in Bhutan for a week. I became a fan of Ema datshi. Bhutan is wonderful place with simple people & simple cuisine. I’d like to travel to Bhutan! But it’s too expensive for me. Thank you for the dishes. I have just come back from 10 days in Bhutan and am suffering from cultural re-entry shock. Your list of foods is a great help! Hope to put on a Bhutanese dinner for friends, though I will lessen the amount of chilies for American stomachs! Say something about Bhutanese Dessert. That bowl of Kewa Datshi looks good! Who doesn’t love cheese and potatoes. Although I wonder, how is the combination of chilies and cheese? Zaow and ezay sound very interesting, come to think of it so do jaju, khatem, gando datshi – and everything else on the list! You have such wonderful photos of all the different dishes, it makes me want to try them all. I don’t know if I could handle the peppers though! Thanks for sharing, all the delicious dishes looks fabulous.i never thought Bhutan have lots of flavours with spice in it. Hi, have you had a chance to try tibetan food.There is a very popular tibetan dish called thupka which is similar to a bhutanese dish though i cannot recall the name. But highly recommended. The butter tea is from yak milk which i must admit is an acquired taste! Chogo looks like an interesting way to preserve cheese plus the Bhutaneese seem to really love their dairy! Prior to reading this I really never had the idea of what sort of food they eat in Bhutan and I must say that each dish look delicious and something I’d love to try! Thanks for sharing this post! Yaksha shakam sounds interesting. I’ve never heard of yak meat before, but it sounds delicious. Bhutanese food sounds like it’s something I would love to try, especially the super spicy one. Can’t live without my peppers! As a cheese fanatic, I think it’s safe to say I will be more than happy to eat the local cuisine every meal when I get to visit Bhutan. Unbelievable post! I visited Bhutan about 5 years ago and didn’t realize how much I missed out on the wonderful food until I watched your YouTube posts. They were wonderful. Now I am eager to return just for the taste. I have watched a number of your videos about Bhutan and enjoyed reading your blog. My wife and I are planning a trip there in November. We are both sensitive to caffeine. I am guessing it might be hard to find de-caf tea. Any suggestions? Brilliant! I absolutely loved Bhutan(my guides swore by it that I must be Bhutanese in my previous life!) Thank you for bringing me back to Bhutan and I reminisce every single dish that you had had. Farm house cooking by the Aums are the best! I had my most amazing meal up in Bumdra Trek when it was freezing cold and we were famished from the all that walking! I enjoyed watching your videos. Kaadrinchey la ! Tashi Delek. yummyyyyyyyyyyyyyyyyyyyyyyyyyyyyyyyyyyyyyyyyy!!!! Mark , mouth watering. Nom Nom Nom. Great pictures. Thanks for sharing, all the dishes looks fabulous. Never thought Bhutan have lots of flavours with spice in it. Amazing Blog! Thank you for sharing with us. Hi Mark! i am a big fan of yours from New Zealand. just wondering your thoughts on how they want to get rid of bangkok street food. I travelled to bangkok because of your videos and loved all the street food we ate! and was planning on travellling back there again just for the food. and personally i think they are making a big mistake getting rid of the street food. I have never considered bhutan food but now looking for a restaurant in my country. 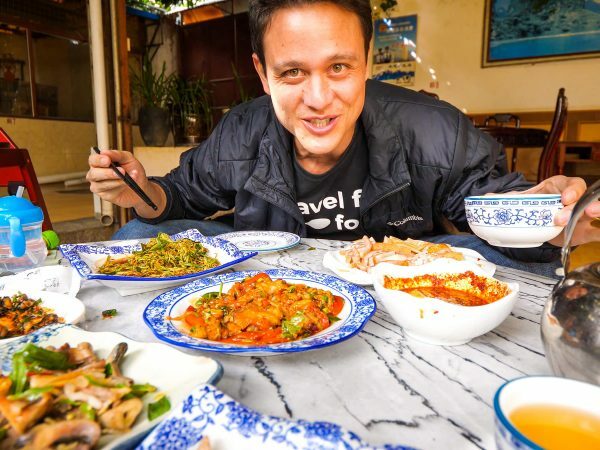 Such a wonderful introduction to Bhutanese cuisines, Mark! Like many people, I didn’t know much about the food of this Himalayan country prior to reading this post. I only heard that they like their chilies. It’s interesting that cheese is widely used in Bhutanese cooking — probably the only country in Asia where cheese is a staple? Thanks for bringing up all those colorful dishes! Thank you very much Bama. Yah, I think you’re right about the cheese, possible Bhutan and Tibet. Hope you’re doing well! Hi Mark. I just want to say thank you for writing this post. I’m traveling in Bhutan now and so far I have tried a lot of the dishes you mentioned here. I still have some more to try and a few more days in the country. Hope you’re doing well! Thank you Aman, I’ll try to mention more Halal restaurants! Hi Mark. I LOVE your two blogs. The food and travel look awesome! I’m just wondering why you chose to set up two blogs instead of just the one ? I’m looking to set up a travel / fitness / rowing blog, because rowing is so niche I’m wondering whether to set up a second rowing/travel blog alongside the main travel blog covering the rowing side of things. Just would like to know your thoughts? Thank you very much Sue. Originally Migrationology is meant to be travel food, but since I ended up staying in Thailand long term, I had too much info on Thai food and restaurants, so that’s why I started another blog – just to cover only Thai food. That’s great news that you’ll be starting a blog! From above comment I just know that you are running 2 blogs. can you please provide me the link of your second blog. Bhutanese food looks similar to the food in Darjeeling. When we were there a few years ago, our guide invited us to dinner in his home. It was one of the highlights of our visit. Bhutan is high up on my bucket list and I’m planning on a trip next year. I love red chillies. It looks like I’m going to love the food! Thank you very much Christina, being invited to eat at a local home is one of the best food experiences you can have when traveling, that sounds amazing! You’re welcome, thank you for reading Peter! wow it seems everything so good!! thanks for sharing! I was hungry and I read this post. Now I only wish to have this delicious food. It looks so yummy! Just awesome…I every single video of your and have been following you for a long time. Getting motivated, I too have started a travel related website – https://rogersvision.com . Do check it out when you get some time and keep up the good work. Thanks Roger, great to see your blog as well! Mark, we just finished watch your trip videos of Bhutan…wow that food looked awesome I think you will have to bring a larger spoon next time! Looked yummy, even the stem of the red Chile! Thank you very much Dale. Haha, that would be awesome! Hey Melroy, thank you very much, really appreciate your support. I’ve been like that every since I was a kid – I really really love strong tasting things – so I guess no other reason than I personally just fully enjoy it! Che piatto é NOSHA PHIM ? e quali sono gli ingredienti? Paa = maiale ? o peperoncino ? That’s was a pretty awesome amount of food, and quite diverse samplings. So much cheese…Well done! Thanks William, never a shortage of cheese in Bhutanese food! Thank you for sharing your experience in this unique and isolated country. Those dishes look truly delicious and made me hungry. Bhutan was not even on my travel bucket list but after going over this post, I will save “MyBhutan” link and will seriously consider making a trip to this country one day. Cool to hear that Dmitriy. Bhutan is such an amazing country! I’m wondering: is it hard to know whether what you’re ordering is typical Bhutanese and not a dish from the surrounding countries? I’m guessing you would now, but for someone who isn’t so acquaintad with the region’s cuisine 🙂 Did MyBhutan offer a lot of guidance with this? Hey Sofie, that’s good question. I think that could be difficult to decipher between the cuisines, but at the same time, in Bhutan they seemed to bit quite separated. Mainly what I found is that in the countryside you’ll mostly find Bhutanese food, but in the cities like Thimphu is where you get more of a mix with Tibetan and Indian. Also yes, any guide, or restaurant owner will be more than happy to tell you if you ask when you’re in Bhutan! Interesting. Never been there but I have visited the neighbouring Indian state of Sikkim a long time ago. It always seemed enveloped in a damp fog the time i was there but Momo’s were everywhere there as well 🙂 It seems so quiet from the metropolises that you normally buzz around but a bit too much cheese for me ( lactose tolerance issues here ) these days. Thank you very much Neil. I had also been to Sikkim before this trip to Bhutan, and I was expecting the cuisine to be similar, but I think it was quite different – especially with all the cheese. Thanks for your support, hope you’re doing well! Hi Mark, what an interesting country, the food looks amazing. Great video, very enjoyable. I can never get to all the places you visit so really look forward to your videos. Safe travels. Theresa. Thank you very much Theresa! Hi! Mark Wiens! I hope you are always well to post more the blog about “Best food …” in the world. I am fascinated by your food photos. It is very beautiful. I can feel the delightful taste of food. I really like fresh chillies and its colour. Thank you very much for your sharing. Thank you very much for your kind words and support Duyen! I am really interested in going to Bhutan now. The food looks so good and the country seems fun to visit. Mark, what are the prices like for food there? And do you really have to pay a fixed charge of $300 a day to visit Bhutan?? There was a comment saying you had to pay $300 a day per person to visit Bhutan…..
Hey Pamela, great to hear that. It’s really one of the most pristine and well preserved countries I’ve ever seen. And the food is so unique. Bhutan is definitely not a cheap place to visit. Normally you do have to pay about $250 – 300 per day on a tour and that includes everything. But things are changing a little bit, but I think you’re still looking to pay around that amount to get your visa. it is quite similar to the food we have here in the north of Pakistan, where 3 mountain ranges meet, the himalayas range ,the,Karakoram range and the hindu kush. I have been to Bhutan b4 BUT it was exciting going with u and the wonderful food !! thankyou Mark for the delicous trip to Bhutan !! Awesome to hear that Tahira, and glad you’ve visited Bhutan. Thank you for reading and watching! We were in Bhutan a few years back. Amazing country and delicious food, but a bit too spicy at times! Hey Stephen, glad you enjoyed Bhutan! I enjoyed every minute of this video. Thank you for introducing & presenting the culinary of Bhutan so well. Looking forward to Day 2 of your travel. I am very excited for both of you! Can’t wait for the next video!!! Hi Susan, you’re welcome, thank you for watching! I had no knowledge about bhutanese food. I can now try it with some confidence. Thanks for the detailed info. Mark, You always do such an amazing job and your passion really shows! Everything you try looks so delicious and makes us want to follow you on every one of your journeys. Thank you again. So excited about the next stop! Thank you very much Cindy, really appreciate your support! 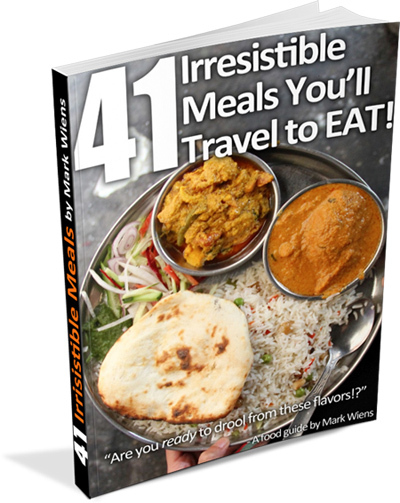 thank you Mark Weins..keep eating and Explore.ive learned many things from you!!! This, like your other videos, there is more than food, there is spirit and the finding of that commonality in each of us. You are a true gem. You and your lovely wife both. Regardless of how my day is going, all that is needed is to watch one of your documentaries and in minutes, I am soaring. If we could all know the love that you bring to each recording, no grief would exist. Thank you so much for bringing the world into out homes. Hey Charlie, that means a lot to me, huge thank you for your support and kind words. so amazing….and yummy for all the foods in Bhutan…their foods and as well in Nepal most closely the same..
Bhutan and their food thru your video is great. Thanks a lot Mark good work!!! Thank you very much Hermie. Hi Mark, enjoy your first Bhutan video alot. As an avid traveler, Bhutan has always been on my radar screen. It is on page 2 on my bucket list instead of page 1. Reason being is the cost of visiting Bhutan. As you probably know, the set ‘fee’ per day is about 300USD. For me, that is large amount. For both you and your wife to visit Bhutan for 30 days, that means the cost of your ‘fee’ almost 20,000USD. I would love to visit there but the cost prevents me from staying any sort of time over 5-6 days. And what made you decide on My Bhutan to set up your arrangements opposed to another outfitter? Kindly advise when you have time….thanks for all your videos….they’re A#1 dope !! Your personal opinions/judgements will be appreciated ! 5. Three meals a day and refreshment. Do you still find it expensive. Hi KC, thank you to Pema for laying out the cost details. At the moment, I don’t think there’s really any way around the fees and Bhutan is not really a budget destination. But that’s also how they’ve managed to preserve the culture and control tourism. It has its benefits and drawbacks, but I don’t think there’s anyway to travel on a real budget in Bhutan. As for MyBhutan, they are a startup, and they invited me to Bhutan as a special circumstance. But the more I got to know them and their goal / initiative – they are blazing the trail to be the first portal for research and arranging trips to Bhutan and really progressing the process of visiting Bhutan, and I really like what they are doing. Wow.. never heard before.. Thanks Mark for these info ???? Hey Mark, love the food introductions although I have never been to Bhutan. I can’t wait to get my chance to taste some of the delicacy, esp Ema datshi.. I love spicy food. Great write up, hope to stay in touch with you. Dumplings are unusual, the skin is like wheat floured, probably more nutritious. Eating out of wooden bowls are simply charming. It’s nice to know about a cultural with a different thinking about food like the Bhutanese. Enjoying your video of Bhutan and the food you get there, as I heard it is difficult to get approval to travel there. You mention in the video you were invited by “mybhutan.com. Was your trip sponsored by them? Hey Melroy, thank you very much. Yes they sponsored and arranged my visa, but for some of the food and trips I did in Bhutan, I paid for that. Hoentay is something i need to try. Thanks for sharing this great info Mark. My mum and i love watching the videos. Introducing different kind of food from different countries. Thank you so much for the fun and very informative post. I would like to offer one correction, though — #22, tsampa. Its usually barley which is roasted to a ‘pop’, and then stone ground. So, it’s not wholewheat flour, or barley flour, but a completely edible, already cooked food. Just mix with butter tea and sometimes the hard cheese. 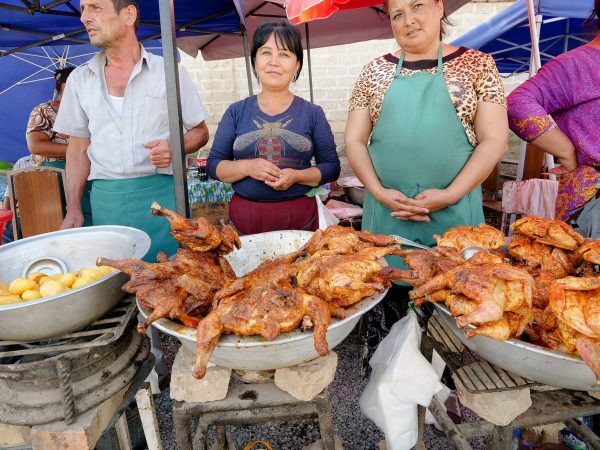 Since it’s already cooked, its a great food for nomads and travelers. Thank you for the wonderful explanation & pictures of the Bhutanese foods! Thank you for the article, it was nice reading about the food of my country and made me miss my moms/ friends cookings. BTW, the pepper you ate in Bhutan is slightly different fron Sichuan pepper from China. It grows in the forests of Bhutan and is slightly bigger and darker in color. Anyway, I am glad that you enjoyed the food in Bhutan. I wish you many many more enjoyable travels in the future! Very exotics!, very detail, great to watch as usual. I never have any chance to go there. Heard that it’s a kind of hard to apply for visa since they are limited the number of tourists which had discourage me for a long time. So, it’s such a treat to see the country through your eyes. I enjoy everything on your site. Would be nice to have the recipes ???? Great Work…Well Done! Mark Like you.. I’m drooling for the Ezay… love Chillies. it is very similar to Sri Lankan- Lunu Miris (Chilli, Onion and Salt Sambol), that eats with Milk Rice in SL. can I get the recipe for this one? lol Seriously! Awesome to hear that Stewie! Always enjoy your comments , food adventures and videos. My wife traveled through Bhutan a few years ago and I really enjoy her photos and stories, She is traveling in Northern India at the moment so I am a bachelor right now but will show her your videos of Bhutan when she gets home, sure to enjoy ! I watched the video where you said it took a year and half to get approved. First day was awesome. I still don’t know how you can pack in all that food! And Ying is so tiny. Love your videos Mark. Thank you Nirmal, glad to hear you’re going to Bhutan soon! Thanks for the wonderful posts and the fantastic pictures! I love your blog . Very informative! You’re welcome Madhusree, thank you for reading! Went immediately to the kitchen and made my own version of Bhutanese food. OMG it all looked so good and spicy Mark. Envious of the life you live. Live it well (which you definitely do) and enjoy it to the fullest. That awesome Paula, glad you cooked some Bhutanese food! Your videos, please keep it coming. I hope that in the near future I’m able to travel the country and try all the foods that you have shared on your travels, for now, it’s your vlogs that I look forward to watching everyday ????????. Thank you very much for your support Monica, really appreciate it. That would be awesome if you can travel soon! Hope you, wife and little one are well. Thank you very much Anwar! many worse where I have also not been. Regards to you wife and look after the little one, health wise too, in all the Countries you travel to. Hi Yvonne, great to hear from you, thank you very much for sharing a little about yourself. That’s no problem at all, it’s still great that you love to travel and visit destinations and learn about their culture. Hope you’re doing well, and thank you again for your support. What Mark Wiens has shown here is not the only food we get in Bhutan. We have lot more than just the spicy food. We have food from the south too, which is Nepali cuisine. I am sure you mentioned that you like it. You can also get your simple scrambled eggs with salt and pepper and your western style pancakes including nescafe coffee with condensed milk. Bhutan is diverse when it comes to Food culture, since Bhutanese are very open to other food ideas and Bhutanese people have traveled outside and brought back all the interesting food concepts in the country. You should check out zhimmey. com, it’s like the yelp of Bhutan where you can find various restaurants with different kinds of dining options are available. I hope it changes atleast your opinion about the food in Bhutan. Awesome Mark. Absolutely love your enthusiasm. Have been watching your vids for many years. Also noticed that you where wearing a migrationology hoody? Are you selling them yet? Hey Will, thank you very much for your support over the years. The hoody was just a 1 time deal thing that I bought… but perhaps I could make some if enough people are interested. I will let you know, thanks! Hi! Mark. Thanks for the wonderful video, it gives me the pleasure of travelling to Bhutan at your cost and effort, thanks for all the hard work. I guess people allergic to dairy would have a hard time eating Bhutanese food, so much cheese and butter probably due do the very cold weather. The dishes seem simple and small. I guess it’s another simple culture lifestyle to experience. Hey Harry, thank you very much, you’re right about the dairy. It’s the most dairy of any country I’ve ever visited for sure, but so unique and interesting. Hello Mark, thankyou for the beautiful report from Bhutan. It is such amazing and different kind of food, with the stuff we used to see. it looks delicious. All the best for baby Micah, Ying and you. I am always very glad to receive your emails. Thank you very much Inge. Hope you’re doing well also! Wow all the dishes are chillies and chillies just watching all the hot dishes make my stomach warm and hot. so many variety of dishes and you never put on weight with all the oily food. Well happy eating all the time in your travel . Thank you and look forward to more wonderful and colourful dishes in your travel. Thank you very much Sally. 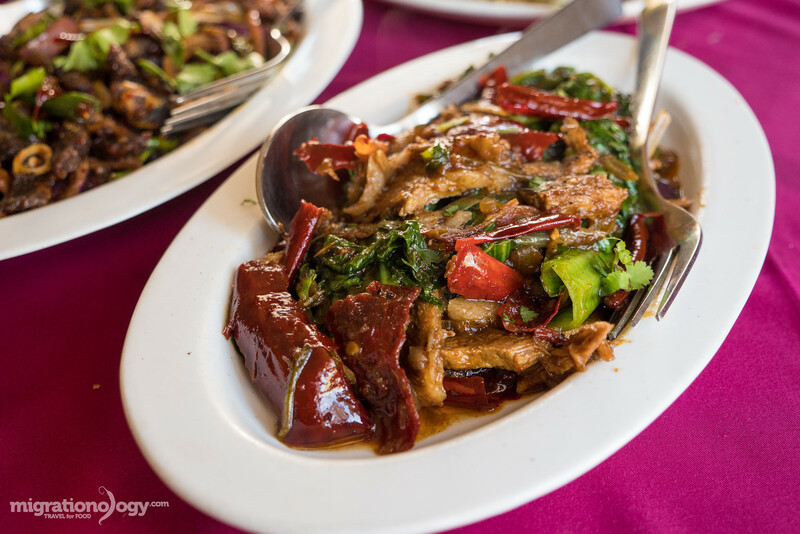 I agree some of the dishes are a little on the oily and heavy side, but they do taste amazing, and I especially loved all those dried chilies used in the food. Thank you again for your support! Thanks for sharing your memorable food experiences. I stumbled on your channel a couple years ago because I have a bucket list fascination with travelling to Asia, and of course the food!! Love your breakdown of local food and experiences. Thanks for helping me prioritize my places to go list. Bhutan is now edged up to top 5. Awesome to hear that Norine. Bhutan is an amazingly unique and fascinating destination, hope you can visit! Hi Mark! Thanks for sharing your Bhutan trip experience with us. I would definitely visit this amazing country one day. Looking forward to watching your upcoming videos! Thank you very much for watching and reading Xin! Hi Dr Geetesh, thank you very much for watching and reading this blog post. Yah, that’s a great idea to visit Bhutan, I found the culture and food to be extremely unique and friendly. Extreme natural beauty and great food! Wel,l that was a very tasty post to me! A month in Bhutan would be heaven for anyone! Ezay made me drool. Nice one Mark. Thank you very much Siti, glad you like the food! Thank you Mark for sharing with us your lovely and amazing experiences! Would love to learn more from you. Thank you for reading Elise! I was fortunate enough to travel to Bhutan for 10 days this past October, and it was a true “bucket list” trip. Our trip was planned through http://www.bhutanonline.net/ and they were simply wonderful, too. We didn’t get the opportunity you did to sample mostly indigenous cuisine throughout your whole trip. Now, THAT’S what I would like to do when I go back! Very cool to hear that Michael, glad you enjoyed your trip to Bhutan as well. It’s such a fascinating country and culture. Thank you very much Safae, hope you’re doing well! I’ve just seen the episode. It’s really awesome. The tiny chicken was looking fabulous and sweetest part is that Buttermilk. We Indian calls it “Chhas”. But all over it’s so good Mark. Thank you for watching Tanmoy, oh cool, thanks for sharing! Hey Mark! Looks beautiful and delicious! I’m curious, do they utilize fish sauce as prevalently as where you live? What fish sauce does your mother in law use, or what is your preference? It’s difficult to find quality products in Europe. Thanks for the post! Always interesting. Our whole family enjoys your content and friendly spirit. Hey Gary, in Bhutan I don’t think they use much fish sauce if any. But in Thailand, we normally just use the typical brand which is Tiparros. It’s not the best quality, but it’s what the majority of Thais in Thailand use. Thanks and keep cooking Thai food! Hi. Mark. Thanks for this delightful email. What lovely food. Looking forward to reading it in great detail. Looks absolutely delicious. Hope that Ying and baby Micah are well. You’re welcome Malcom, thank you very much for reading! Hello, Mark already watched that video eagerly waiting for next video. Bhutan is very peaceful country. Keep doing the good work. And, God bless you, Micah. Thank you very much Prashant, hope you and your family are also doing well. As and when got a chance,will visit Bhutan. Thank you Raji, that would be great! You’re welcome, thanks for reading Aaqib. Mark, this is simply wow. I remember that about 25 yrs ago I had been to Thimpu and Paro and had their local dishes, but they sounded the same. But I don’t remember much of the taste. However, your blog post brought some of my memories clear once again. Thanks. Take care, you, Ying, Micah and your mom-in-law Will catch you up when I’m in Bangkok, for though I stay in Kolkata, my heart is always in Bangkok !! Hey Bob, great to hear from you. Happy that this post brought back good memories about Bhutanese food. Thank you very much for your support, hope you’re doing well.